Jason - We would like to replace petrol with a biofuel like ethanol. The problem is that ethanol, at the moment, is made from sugar from sugar beets, or starch from corn and those are things that we eat. And so there’s a big ethical debate as to whether we should be taking food and turning it into fuels. What we have done is make biofuels and bioethanol from trees and this enables us to move our energy production off of agricultural land, and yet make sustainable fuels that won’t lead to CO2 emissions. Chris - Why is it a challenge to make alcohol from things like trees? Are we not already able to do that? Jason - We’re already able to do this, but the technology is very, very expensive. The most expensive part is the protein, or enzyme that breaks down cellulose to make sugars like glucose. Chris - When you say cellulose, that’s wood right? Jason - Yes. Cellulose is the main component in wood. 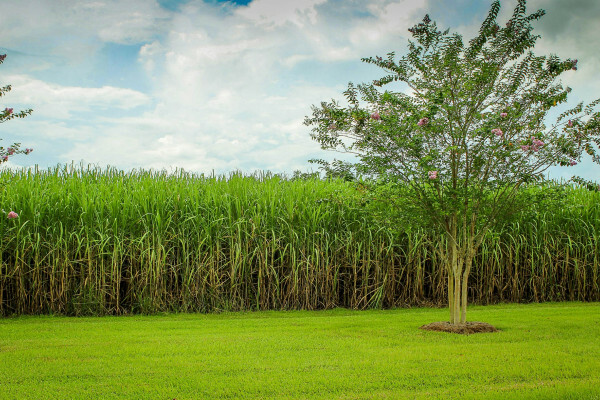 Kind of a surprising fact, but trees are about 70 percent sugar. Roughly 50 percent of a tree is made up of cellulose which is a big polymer of glucose, sort of like starch, but not one that we can digest. Microbes, like fungus, are able to do this because they have special enzymes. Unfortunately, those proteins were evolved to not work very fast and so this whole process is incredibly slow, far too slow for us to make biofuels this way. Chris - How have you tried to intervene and soup up the process? Jason - What we did was we modified the surface of the protein using chemical techniques in order to make it much more stable. The second challenge that we had is that cellulose doesn’t dissolve in water. Now this is actually a good thing; if cellulose did dissolve in water then every time it rained all of the forest would dissolve. What we did is we dissolved the cellulose in the only medium that can do that, which is a liquid salt, sometimes called an “ionic liquids”, sometimes called a “molten salt.” This enabled us to put the cellulose into solution, but in order to get the protein to work in that environment we had to protect it and so we had to modify the surface of the protein so it could withstand high temperatures - temperatures above the boiling point of water. This made that cellulose to glucose reaction very very fast, which would enable us to make the biofuels much cheaper and much more quickly. Chris - When you use this, how does it perform? What sorts of metrics do you get out of it? Jason - On its natural substrate; two glucose molecules bound together and it chops them into two, we were able to increase the rate of that reaction by a factor of 30. But the far more interesting thing was that now we could take cellulose, which is a massive polymer of glucose, and we were able to break that down with one single enzyme, and in natural conditions this is impossible. Chris - So how would it work then? People would dump what, their garden refuse - whatever into their green bin, it would come to a plant, and how would it then get turned into ethanol with this added to the process? Jason - This would be a way of enabling what we call “a consolidated process.” So we’ve taken two steps and put them into one so you can use this ionic liquid or liquid salt to dissolve your green waste into a liquid form, put in the enzyme to break it down to sugars, and then the sugars go off for fermentation to make biofuels or bioplastics or whatever sort of renewable materials that we would want. Chris - Beyond just biofuels, given that stabilising enzymes is a real challenge for other sorts of industries in lots of different contexts, could you take the learning from this and now apply it to maybe washing powder to make better biological washing powder? I mean, that’s just one example but you see where I’m going with that? Jason - Yeah. And it’s actually, it’s a very good example. I was talking to one of the world’s leading manufacturers of washing powder about this technology just last month. It turns out that stability under the conditions that exist in a washing machine is a really big issue. And the enzymes that are used in washing powder tend to lose a lot of their activity very very quickly during the wash cycle. So yes, this could very easily turn into a solution to that problem as well. Previous The science of ROARING! Next Mythconception - do most birds really mate for life?